A 19-year-old has admitted making bogus bomb threats that triggered the evacuation of more than 400 UK schools. George Duke-Cohan, from Watford, also caused an airport security scare by reporting a fake hijacking while on bail. At Luton Magistrates' Court, he pleaded guilty to three counts of making hoax bomb threats. The teenager was remanded in custody until his sentencing at Luton Crown Court on 21 September. 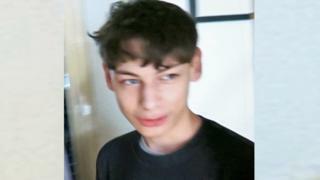 Duke-Cohan, of Mutchetts Close, caused widespread panic in March when he emailed thousands of UK schools to warn about an explosive. He was arrested days later but in April, he sent another batch of emails to schools in the US and UK while under investigation, the National Crime Agency (NCA) said. The teenager claimed a pipe bomb had been planted on the premises. Duke-Cohan was arrested for a second time and released on bail under the condition he did not use electronic devices. But months later, in August, his name was in the frame for a third hoax claiming hijackers had taken over a United Airlines flight between UK and San Francisco. A joint investigation between the NCA and the FBI found Duke-Cohan had called San Francisco Airport and their police force while he was on bail for the two previous offences. Duke-Cohan was arrested for a third time on Friday and found to be in possession of numerous electronic devices, despite the restrictions in place. Marc Horsfall, NCA senior investigating officer, said the teenager had caused "serious worry and inconvenience to thousands of people" and had "no consideration for the effect he was having on others".